If you plan to blog regularly, you will need a regular supply of material to blog about. If you’ve been blogging for a while, you may have already plucked the low-hanging fruit – the ideas which first prompted you to start writing, the hot topics which pushed your buttons. But now you still need fresh content. How can you find it, and how can you give yourself structure so that all your writing time is productive? Here are some suggestions. You need a problem to solve. Every blog post needs a theme, a problem, and some suggested solutions for that problem. If you’re blogging fast, then three is a nice round number of solutions – though a lot of bloggers favour nine or ten, or go completely crazy and promise 50 ways to address your issue. If you can come up with a title, a problem for that title, and three ways to solve it, you’re good to go. Once you start writing, more ideas will occur. Think of issues you yourself have faced, and if you have already blogged about them, seek out the problems others are experiencing. How could your content approach these issues in a fresh way? If thinking about problems seems rather negative, turn that on its head, and think of your personal successes. Then consider what you had to overcome to achieve that success. Tada – you now have problems, and solutions, and a happy outcome you can offer your readers. Action: think of the top five problems in your blog’s theme. For writing, these might be to do with grammar, writer’s block, and finding inspiration. Invent a snappy title for each problem, and list three possible ways to resolve each problem. Bonus: what twist can you put on the problems facing your readers? What have you done that might seem weird or counter-intuitive, but which worked for you? You need the magic combination of restriction and freedom. This sounds as if it would restrict the flow of ideas, but the opposite is true: give your brain a limitation and it will work harder and more creatively to resolve it. Saying, I must think of something about Gardening for my gardening blog, is likely to result in a blank page. Say instead, I must think of 30 ways to handle vegetable growing in a dry climate, and your botanical brain will come up with 40. Have regular brainstorming sessions to think of themed ideas for new content. Set your imagination a challenge to come up with new or more or crazy ideas for a very limited theme and it will suprise you with how much material it generates. Action: Make a list of tightly-themed titles right now and use them as your jumping-off point. That’s what I did for this challenge – there’s no way I could come up with something new 26 times just off the bat. 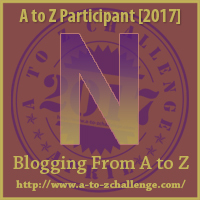 I had a restrictive A-Z structure, see my post about this, and then I worked out a list of titles, and voila, I had a starting point to write from. You need a fallback plan. If you’re blogging alone, creating one-hundred-percent zinging new content is going to be very hard work. That’s OK, but sometimes you need to accept that a post will offer more general content, that forms part of the ‘reference section’ of your output. This might be a master post list, or a post researching someone else’s brilliant idea. Start an ongoing feature and return to it whenever you have a fallow period. On a car restoration project blog, you might have an ongoing series on Worst Tweaks Ever, or Wildest Transformations. They’re not your car projects, but they’ll still be relevant to your readers. If all else fails, write a review – of a conference, industry event, new book, or film. If you attempt this, the item in question must be blog-relevant in some way, and your writing must be sufficiently entertaining that people who have not experienced this book/film etc will still enjoy your post. I will read anything by David Mitchell or Jemery Clarkson – who each write on a broad range of topics – because I am completely confident that their piece will make me laugh. I care not one bit about shiny cars, but Clarkson can make anything entertaining. His politics are not my politics but I still love to read them. And Micthell could make a shopping list fascinating and hilarious. Action: seek out news relevant to your readers and write a post about it – or invent an ongoing feature for your blog that you can return to when writing times are hard. You need a guest blogger. if you’ve temporarily run out of fresh material, or simply want to expand what your blog offers, invite a friend or colleague to write for you. Find a like-minded blogger and collaborate – write a post for them too, and share the exposure. Somehow it is much easier to come up with ideas for someone else’s thing than your own, so this approach could have multiple benefits. Action: invite a guest blogger to contribute. Most people will be flattered to be asked, and will bring a fresh take on your theme that readers will appreciate. I hope this helps. How do you consistently generate fresh blogging or writing ideas? Let me know in the comments!